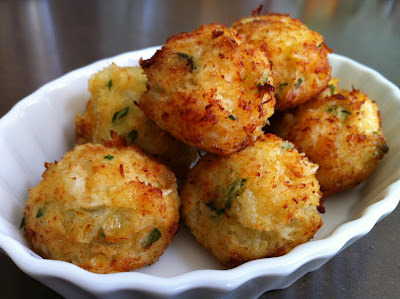 salt cod and crab fritters | what is clara eating today? Boil water in a large pot. Reduce to low heat and add the salted cod. simmer for 20 minutes. Drain well and cool to room temperature. Boil water and cook cauliflower for 10-14 minutes, until they are very soft. Drain, and mash in blender or food processor. transfer to a bowl and set aside. Heat olive oil in medium heat and saute onion until golden brown. Add garlic and cook for another minute. Add to mashed cauliflower. Finely shred cooked cod using food processor. Add to cauliflower. Add cilantro. Mix and season with salt to taste. Add egg yolk and crab. In a small bowl, whisk the egg white to soft peaks and gently fold it into the cod mixture. heat oil (1.5 inches deep) in medium-high heat. fry fritters in batches of 4-5 until golden brown. Serve warm or at room temperature.